Grab-and-go mobility: At only 0.8lb (360g) and 4.1" wide, 4.1" long and 1.4" high, it’s both lightweight and ultrasmall, literally fitting in the palm of your hand. Its small size means it’ll easily fit into any size bag and is so light you’ll barely even notice you’re carrying it. 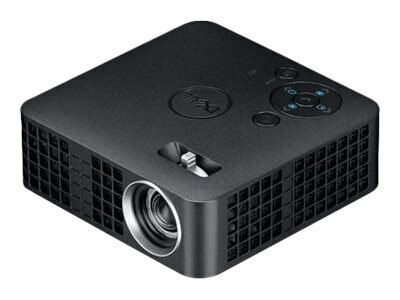 Lose the wires: Connect wirelessly to your laptop, tablet or mobile device with the optional Dell Projector Wireless Dongle – WD518. Use the compatible app on your smartphone, tablet or laptop and start presenting, all without a wired connection. End the outlet search: No power outlet? No problem. Simply connect and start presenting. It provides approximately 2 hours of life on average, when connected to the Dell Power Companion PW7015L ? that’s enough for most presentations or movies. Even an uncertain setup is no match for this truly mobile projector.